Survival and immune response of drones of a Nosemosis tolerant honey bee strain towards N. ceranae infections. Huang Q, Kryger P, Le Conte Y, Moritz RF. Honey bee colonies (Apis mellifera) have been selected for low level of Nosema in Denmark over decades and Nosema is now rarely found in bee colonies from these breeding lines. We compared the immune response of a selected and an unselected honey bee lineage, taking advantage of the haploid males to study its potential impact on the tolerance toward Nosema ceranae, a novel introduced microsporidian pathogen. After artificial infections of the N. ceranae spores, the lineage selected for Nosema tolerance showed a higher N. ceranae spore load, a lower mortality and an up-regulated immune response. The differences in the response of the innate immune system between the selected and unselected lineage were strongest at day six post infection. In particular genes of the Toll pathway were up-regulated in the selected strain, probably is the main immune pathway involved in N. ceranae infection response. After decades of selective breeding for Nosema tolerance in the Danish strain, it appears these bees are tolerant to N. ceranae infections. Will the Olympic Peninsula’s hardy honeybees save the world from colony collapse? The last time we checked with Seattle mayor-turned-beekeeper Wes Uhlman, his two hives on Queen Anne Hill were doing fine. It was three years ago, and all across farm country a mysterious syndrome called colony collapse disorder was making bees abandon their doomed hives, threatening an agricultural catastrophe. But CCD hadn’t slammed Uhlman or his fellow local backyard beekeepers as severely as others. That made him suspect that Big Ag pesticides—not a big factor on Queen Anne—were the cause. That was then. Now bees are suffering even here. This spring, one of Uhlman’s two hives was kaput and the other ailing. Salvation could come from the Olympic Peninsula. There, at the Olympic Wilderness Apiary—just west of the town of Joyce—Dan and Judy Harvey produce queen bees for other keepers. For years the Harveys have employed herbal supplements, good nutrition, and selective breeding, minus conventional chemical treatments, to produce bees resistant to varroa mites, a parasite widely blamed for colony collapse. But in 2007 a fungus called Nosema ceranae started ravaging the Harveys’ hives. They lost 80 to 90 percent of their bees in 2008, and the same again in 2009. But they noticed that wild colonies in the deep woods were faring better. These colonies—descended from bees that loggers and farmers ordered from Sears Roebuck in the 1920s and ’30s—had evolved to thrive in the soggy, fungus-ridden Olympic climate. The Harveys collected wild queens and bred them with their own varroa-resistant lines. Even when fungal infestations appeared, they skipped standard antibiotics; instead they drenched the little buzzers in oak bark extract and essential oils and fed them lavishly through the winter. Bingo. “This year we only lost about 20 percent,” says Dan. When Sheriff’s Deputy Joe Pursley flashed his lights and pulled over behind a backhoe truck parked on the verge on Frontier Street in Clallam Bay, Thursday, Oct. 17, he thought he was only going to warn about a road blockage issue. Instead, he found himself dealing with two people facing off over the same downed bee tree. Dan Harvey, who had begun the careful rescue of the bees on Wednesday, found that Rafael Ojeda had undone his work and chain-sawed the nest tree open, roughly pulling out the combs and dumping them into a manufactured hive body. 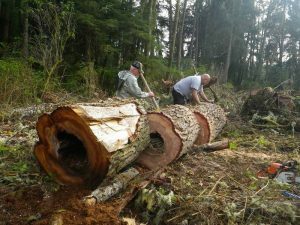 Harvey, who raises queen bees bred from the Olympic Peninsula strain of feral bee in his bee yard at Olympic Wilderness Apiary, was alerted on Tuesday, Oct. 15, about the nest by Lyle Sage, who had clearcut the roadside maple grove, and discovered the bees inside a hollow hemlock. Harvey was eager to find these bees, especially their queen, for addition to the gene base of his own strains of the singular local bee. On Wednesday, Harvey had found the remainder of the hemlock log was too big to move without heavy equipment. The bee cavity was full of rotted mulch, but Harvey knew that 80 percent of feral bee trees locate their entrance above their brood nest. He didn’t have to dig far into the top end of the log before he could see the comb. He sprayed the area with liquid smoke to quiet the bees, as well as the nest entrance, located in the badly healed branch cavity that had let in the original rot. Harvey was assisted by Gus Gustafson, who has split bee trees in the past. Gustafson sawed through both ends of the log under Harvey’s guidance, first carefully poking with the chainsaw, probing for honey, to make sure he wasn’t punching into the nest cavity. Once the chainsaw came out dry, the saw whipped off the bottom of the log. The resulting raw hive might have been small enough to roll, but was still too big to lift into Harvey’s truck. Gustafson wondered if they should just saw slats off the thick outer wood around the cavity, to lighten the load. “No, this is what we call field expediency!” grinned Harvey, adding he’d rather not, because it wouldn’t look good in his bee yard. To protect the bees and their attractive honey from bears and raccoons, Harvey nailed a small square of plywood over the top, and screened off the base and nest entrance. Knowing the bees, already stressed by the felling of their tree, couldn’t last many days trapped inside their nest, he quickly left to borrow a backhoe. He couldn’t return until the next Thursday morning, when Pursley found the two men exchanging words. Ojeda said that someone, whose name he does not know, told him about the tree and warned him that residents would come spray and kill the bees if they discovered them. Ojeda arrived, probably soon after Harvey had left. He tore off the plywood and screens, saying he’d taken the latter with him. Thursday, Harvey discovered the condition of the nest. Harvey shook his head, saying the bees were badly weakened and probably couldn’t survive the winter, even if he added his own bees to them. Ojeda claimed the queen was in the hive box, but Harvey couldn’t find her. In the end, Harvey took Ojeda’s box, to transport what remained of the colony to his bee yard. He hoped the queen was in the box and not hiding in what remained of the shattered nest. On Friday, Harvey found the queen, so he has a chance to broaden the genetic base of his stock and contribute to the health of all the feral survivor bees. It’s one more step in maintaining a non-native domestic animal that actually contributes to the health of the wild and has become a special part of the local environment. The wild bees of the peninsula are descended from domestic Caucasian strains brought to the area by homesteaders in the 19th century. Locally nicknamed “pioneer bees,” and designated by Harvey as “survivor bees,” they are different in appearance from other, more-recently imported domestic bees, carrying a wisp of fluff on their abdomens that makes them appear gray, earning them their other nickname, “gray bees.” They have evolved to survive the wet winters and short summers of the peninsula. However, they aren’t immune to European foul-brood, a disease that turns the larvae in the combs into so much protein goo. Harvey said he’d brought home feral populations before and the young collapsed under the disease attack. Hives also are attacked and weakened by the Varroa mite, that have been theorized as being one of several causes of colony-collapse disorder threatening domestic bees. Harvey has been working with university programs to breed foul-brood-resistant Russian and Varroa Sensitive Hygiene (VHS) strains into the local bees. The added strains are both known for their very hygienic brood-comb behavior, keeping the cells so clean the infection and mites have less chance to start or spread. Resistant drones (males) have been introduced into the wild during the swarming season to improve the wild-living strains. The colony had fed a larvae with royal jelly, making her into a queen in a larger, cone-like cell. When she matured and mated, the younger generation of bees would have followed her into the surrounding woods. Perhaps the flowered bush will still hum with bees next summer. Given opportunity, the bees can colonize a building very quickly. Dona Lynn Olson, of Olson’s Resort, was aware of the local strain’s existence. Several years ago she displayed an entire disused shed full of the bees on her property in Sekiu. The only problem they might cause would result from honey stored in the space between the ceiling and the roof; busy bees could have pumped 3,500 gallons into that space in a fast blackberry-blossom summer. Before it was all over, Jane Hielman, of the Sunsets West Co-Op added a bee story of her own. She’d been on a plane that had to land in Darwin, Australia, because someone on board a two-story 747 had smoked their beehive and it had set off the carbon dioxide fire-represent system in the plane. Harvey and the correspondent, by this time having had too much fun on the bee project, wondered how one transported bees in the pressurized body of a commercial flight. Did they have to buy the bees a seat? Did they all sit in row “B”? This is our strongest breeder colony. She is a 2009 Queen. Entirely untreated; has never exhibited symptoms of dwindling; and has had 4 to 5 brood combs removed and added to weaker colonies throughout the 2011 season, yet remains vigorous. Sample was also submitted to Dave Wick at BVS, Inc. Testing indicatd the presence of IAPV, CPV and Sac Brood virus. (Dave did confirm that IAPV and black queen cell virus are associated with n.ceranae, however he was not able to confirm that CPV is). Only 5% of our 2011 colonies showed no sign of dwindling after their 4th cool; wet; protracted winter. Now in the 5th spring since the devastating losses from this pathogen, our untreated bees are thriving in spite of staggering nosema spore loads and associated viruses, and we have had only 10% winter loss in 2011-2012. Each year we selectively breed a limited number of high-quality regionally adapted honeybee queens for sale. Although customer testimonials give high performance marks to our stock from all over the continental US and Alaska, our queens are not for everyone. Our breeders are derived from feral lineages that have been self-sustaining in the temperate rainforests of Washington State’s isolated Olympic Peninsula since the first pioneers introduced them over 150 years ago. While temperament is an aspect of our selection criteria, it is not our top priority. Since we began our program in 1997, our goal is to achieve sustainable mite, disease, and pathogen-resistant stock. It is our theory that decades of selective breeding to satisfy the demand of commercial agri-beekeeping has reduced the available gene-pool’s ability to naturally defend themselves. A century and a half of wild survival in our harsh climate, coupled with regular inclusion of the best SMR/VSH/Russians available, and our choice in 2008 to allow accelerated natural selection to the newer nosema ceranae fungus have produced vigorous hybrid genetics. Regardless of location, we believe serious beekeepers who are working toward improving survivability of their honeybee stock without the need to use chemical miticides or antibiotics will easily recognize the benefit of including our hardy survivors in their breeding program.